UEFA has reduced sanctions against Marseille following an appeal, meaning a suspended ban from playing in European competition no longer applies. The Ligue 1 club had been given a ban from playing in the next European competition for which they qualified, deferred for two years, after they were found guilty of breaching UEFA rules in four Europa League matches last season. They were charged with crowd disturbances, acts of damage, setting off of fireworks, throwing of objects and a delayed kick-off, spanning their last-eight meeting at home to RB Leipzig, both legs of the semi-final with Salzburg and the final against Atletico Madrid in Lyon. 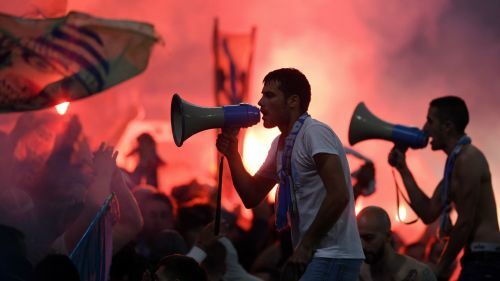 However, having appealed against the decision, Marseille's punishment has been reduced to a two-game stadium ban by the UEFA Appeals Body, with the second game deferred for two years. They will therefore play behind closed doors when Eintracht Frankfurt visit for their Europa League group game on September 20. Marseille have also been ordered to close the north and south stands of the Stade Velodrome for four European games, although two of those matches are also subject to a two-year probationary period. A fine of €100,000 and an order to contact Lyon to pay for the damage caused by fans during the Europa League final still stand.